Happy Monday! Hard to believe that January is almost gone and February is right around the corner. This week I have the Scrappy Layered Log Cabin blocks on the design wall. 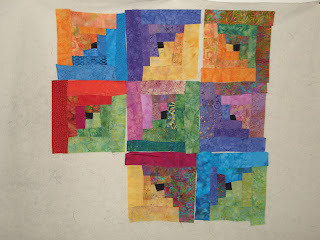 This is from a class taken at Road to California Quilt Show a couple of weekends ago. I was able to finish 8 blocks in class and need to make another 8. This was a really fun technique where you use wavy strips and top stitch them down on one another. Every one's blocks ended up different sizes depending on how much of the previous strip you covered up. Once you get going they are pretty easy to make. There are also triangle pieces that are layered on and the class sample had crystal embellishments. Not sure how far I will get this week as the other project I am working on are the Chunky Churn Dash blocks for a block exchange that is due at the end of February. Have all the pieces cut out and they should go fast, but need to make about 50 or them! Hope you are all working on something fun this week. Check out all the other great projects at Patchwork Times. Wow - that is cool!